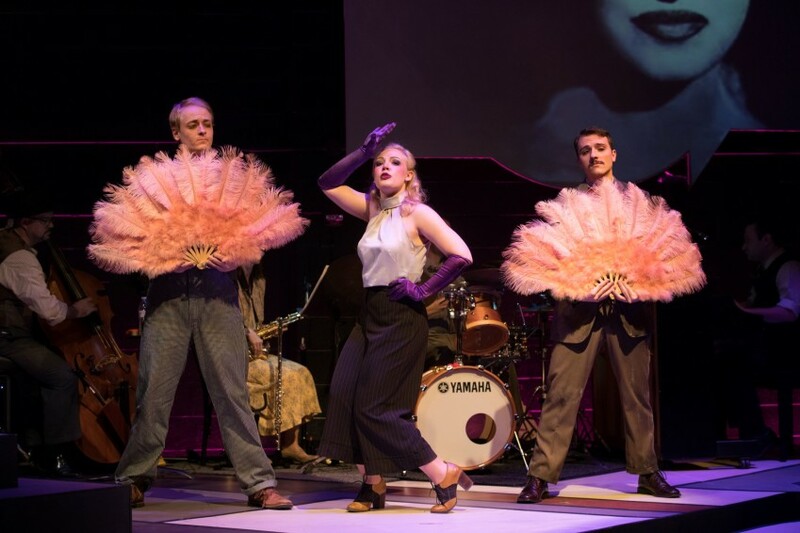 The Department of Theatre and Dance at West Chester University of Pennsylvania (WCU) presented Berlin to Broadway with Kurt Weill, a Musical Voyage,with a cast from the Theater and Drama Department. The performers, both present and former WCU students, shared their experiences with this unusual musical. They talked not only about the historical aspect of this piece and their favorite songs, but also about the similarity between life during times of great upheaval in Brecht and Weill’s Germany and the U.S. today, showing the importance and relevancy of theatre in giving audiences not only entertainment, but also a chance to reflect. 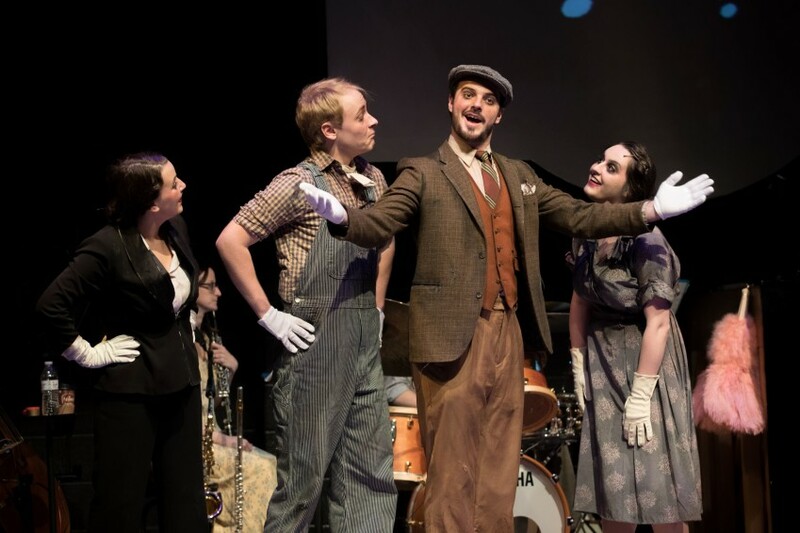 The creative faculty team included director and choreographer Liz Staruch, music director Christopher Tolomeo, vocal director Jesse Padgett, costume designer Constance Case, and many more members. The WCU production, part of the international part of the Philadelphia Fringe Festival, took place at L’Etage, Philadelphia’s premier cabaret, to a standing-room only audience. Rebecca Allen, Pat Festa, Teagan Edsell, Lauren Ralston (L-R), “How Can You Tell an American”, Courtesy of West Chester University. How has your knowledge of Germany in the 1930s and 40s impacted your work in presenting working-class people in Berlin? Kyrsten Bowman: Understanding the unbearably harsh conditions after the collapse of Germany in 1918 and the suffering during the Weimar Republic with millions of unemployed workers was essential to the portrayal of the characters in the opening song “How to Survive” [aka “What Keeps A Man Alive”] from The Threepenny Opera, with lyrics by Bertolt Brecht and music by Kurt Weill. Workers were starving, desperate to do what they could to survive—without any regard for their fellow men. In the US, and in Europe, unemployment soared after the Great Depression in 1928 and 1929. It became increasingly difficult for people of the working class to earn any money to meet their needs. Desperate, they did whatever they could to get by, even if it meant hurting someone else. I love how our perspective in this number shows the people becoming monsters. The cast portrays the workers’ desperation in a way that shows how terrifying life really was—leading up to Hitler’s victory in 1933. Caitlin Thompson: Workers in Germany were upset with their country which had deprived them of finding peace, money, and protection. That situation resulted in workers becoming more self-reliant. The relationship that my character from Happy End, Lillian, has with her love interest in “Surabaya Johnny” revolves around “Johnny” and his need to fend for himself, using women only to gain something beyond the squalor of his life. My costume includes a shawl, which I keep wrapped around myself throughout the song as a symbol of protection. Lillian does not want to let him go, nor does she want to change a part of herself. Johnny rejects her intent to try to have a life together, and although she questions him as to why he treats her poorly, she understands that Surabaya Johnny, the notorious ladies’ man, became the man he is because of his need to live a seedy lifestyle. By the end of the song, she discovers that she cannot change him. As hurt as she is, she must change herself to survive. As a result, she takes off the shawl. It stays off for the last chorus as a final monument to courage and acceptance of the life into which she was born. What was your favorite song, and why? In an age where interpersonal connection is becoming less and less of a priority, partly due to technology, it is becoming more difficult to reach out and forge new relationships. We have lost a bit of that spontaneity and beauty that accompanies creating a bond with somebody outside our comfort area. Caitlin Thompson: My favorite song was Lonely House (lyrics by Langston Hughes), both because of the sad reality it presents and the way our fellow actor, Pat Festa, chose to interpret it. I think it’s the most depressing song of the entire show, and for some reason, that’s why I’m drawn to it. Despite all of what was going on internationally between Germany and the rest of the world, this song feels like the truth at heart for the individual citizen. Intimate and vulnerable, the way the music makes me feel changes the way I interpret some of the lyrics: “For me the night is not romantic/Unhook the stars and take them down/I’m lonely in this lonely house/in this lonely town” (Hughes and Weill). Every night, Pat would discover something new that would resonate with the audience in a different way, and I could feel that even from the backstage in the wings. He told a story and I always believed it. Kyrsten Bowman: I fell in love with Weill’s music from the start. Every orchestration is breathtaking and the lyrics convey extremely pertinent messages to this day. My favorite song, “Lost in the Stars,” not only makes the audience and cast cry nearly every time with its beautiful melody, but the lyrics tell a story of a greater power of good that will always overcome evil. Even if you get lost in darkness, you will find light. This is a message I believe everyone should hear. John Leiderman: My favorite song is “Lost in the Stars,” which comes at the end of the show and always moves me. It is one of the few moments where the entire cast shares the stage and sings beautiful harmonies together (specifically, “and we’re lost,” that everyone adds onto in harmony) to wrap up the story we have just shared with our audience. The song makes me, as well as the rest of the cast, emotional when we sing it, which only adds to the beauty of it. Lauren Ralston: I love performing slower pieces, so “My Ship” from Lady in the Dark was right up my alley. The song is about human connection and love rather than materialistic wealth. My struggle was that this was one of the more well-known numbers in the show, previously performed by legends such as Judy Garland and Julie Andrews. I wanted to do this number justice and honor the greats who have sung it before. Ira Gershwin’s lyrics read, “the pearls and such/they won’t mean much if there’s missing just one thing.” The singer realizes that the ship might as well not ever come if her true love is not on board. “If the ship I sing doesn’t also bring my own true love to me” emphasizes love and human connection as more valuable than pearls, diamonds, and wealth. Time repeats itself, including the hate in the US today and situations we put ourselves in, no matter what, because we are the cause of most of it. It was spell-binding to have the audience see what we do to each other, whether it be 80 years ago or today. A hard song to swallow, but one we sadly still see in our lives. What similarity do you see between life during times of great upheaval in Brecht and Weill’s Germany and the U.S. today, which could show the importance and relevancy of theatre in giving audiences not only entertainment, but also a chance to reflect on the vulnerability of life? John Leiderman: There is a lot of conflict surrounding the United States government right now, and it has divided our country almost in half. This is similar to how the Nazi party took control of Germany in the 1930s (Us versus Them). This show gave us a chance to share with audiences a message, which expresses the struggle and hardship that many people face when a country is divided. A moment of this show that expressed the dilemma that Weill faced involved three different radio broadcasts that took place simultaneously: one from Germany, one from France, and one from England. The broadcasts explain that Weill has to leave Germany and flee to France for safety. While this was happening, the Nazis burned and destroyed his work that he had done previously [because he was Jewish]. People in America today feel this sort of destruction in their lives, whether it be losing their job, or having members of their family deported back to a different country. Lauren Ralston: Although written and originally performed in the 1930s and 40s, Weill’s compositions are just as, if not more, relevant to today’s society. With themes of political corruption, social injustice, and cries for change, Weill unwittingly warns us that history does repeat itself. With all that is going on in our society today, the messages of this musical show are more important than ever. 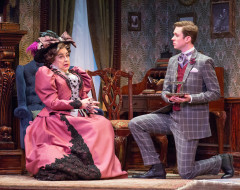 A perfect example from our production is “How Can You Tell An American” [from Knickerbocker Holiday]. This upbeat number pokes fun at how we define an American, while also delivering some funny political jabs that are easily applicable to our current administration. However, despite the title, the number never addresses what an American actually is. This gives the audience the chance to take a step back and reflect on how we personally define an American, and what that means to each of us individually. Caitlin Thompson: There’s a similarity in the way people then and now have to believe in something to move forward. Back then, there was an underground hope that the war would end someday, and now there’s hope that our country will someday restore itself to a culture that promotes freedom of expression. I look specifically at Lost in the Stars. It relates us to the common interest of finding hope within ourselves, and within a future we might not see or understand yet. In [American] theater, there seems to be a defining factor where every story has to end with hope. However, our show depicts hope in a very realistic sense, where our beliefs lie in our natural need to move forward.